Fill Out The Form Below To Get The eBook Now! The transition that comes when summer melts into fall is one of the most magical moments to experience both on the farm and in the kitchen. We have been busy little bees putting up sauerkraut, pickles, jams, jellies, and all manner of frozen goodness for the cold months ahead – as many of you have also been doing as well, I’m certain. Unfortunately, we can get so focused on preserving the bounty at hand that we forget to partake of the soil’s offerings – perfectly ripe fall tomatoes, fresh green herbs, ripe fruit plucked from the tree, and (of most importance) the eggs with deep-orange yolks that grace our table multiple times a day. Pair with those offerings the comforts of a cozy fall kitchen, the smell of freshly baked bread, and the sustenance of grilled meat – there is certainly much to be enjoyed. 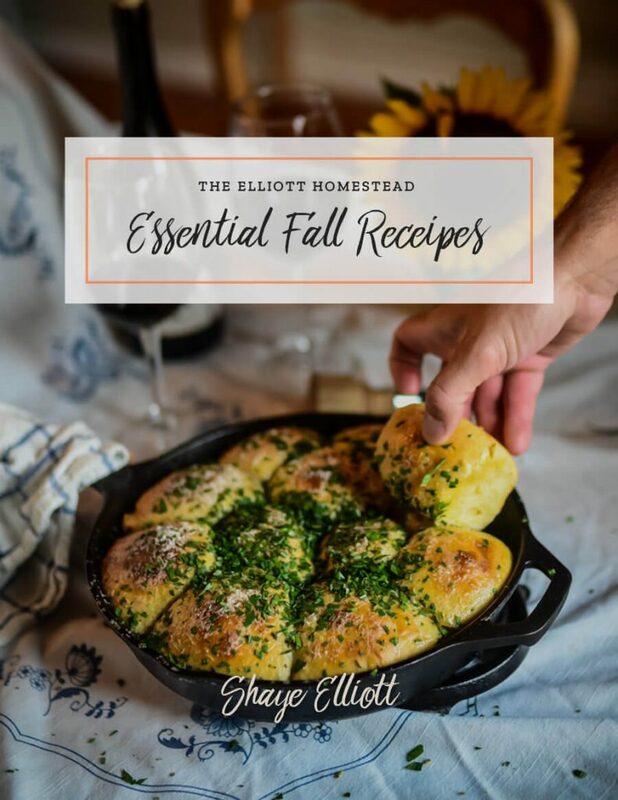 I’ve put together a fresh printable of a few of my favorite new fall recipes for you to enjoy in your own kitchen. They’re easily adaptable based on your family’s needs and your garden’s offerings. I enjoy taking a recipe, flipping it on its head, adapting it with what I have on hand, and sprinkling it with a little magic – it certainly keeps it exciting and I hope you feel the liberty to do the same with these recipes I have to offer you. We’re starting with breakfast – a Savory Dutch Baby with Parsley and Bacon. I refused to flip pancakes for six people and recipes like these Dutch Babies are the answer to that. They can be whipped up in less than five minutes and left to puff and bake in the oven while you milk the cow, sip your first cup of espresso, read your favorite lifestyle book (Seasons At The Farm, anyone? ), or snuggle your babies. Next, we’re heading into a full supper menu – Flank Steak with Tomatoes and Parsley Salad, Herbed Sourdough Supper Rolls, and for dessert, Caramel Apple Slices with Walnuts. Given a choice, my children would opt for the Caramel Apple Slices as their favorite – but the Flank Steak is what causes Stuart and I to groan with delight. Though, honestly, how’s a girl to choose? A buttered roll, baked fresh and pulled straight from the skillet, is certainly balm to the soul. The smell alone, drifting through the rooms of the cottage and beckoning all from near and far to come and investigate, is worth the effort. These recipes can be made all together for a grand autumn feast or pieced apart separately to fill in gaps in your weekly menu. My hope is that regardless of how or when you make them, they’ll encourage you to find joy in cooking. The PDF can be easily printed and tucked away in your kitchen. It includes photographs of each finished dish so that you know what to expect (I hate having to guess). I only started cooking because a few cooks sparked inspiration in me to do so – I hope these recipes can be a part of that spark for you! Happy Autumn.